MIDCO HT and DT removable insulation pad systems are field measured, custom fabricated, and installed by our experienced craftsmen. Pad systems specifications are based on application, temperature range, and approved materials. 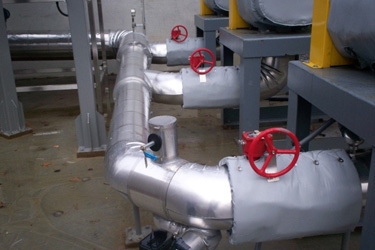 Removable pads can be fabricated for all industrial piping systems, equipment, vessels, and ductwork. MIDCO HT and DT removable pad systems are constructed of the highest quality materials including cloth jacketing, fiberglass mat, ceramic wool, and fastening systems. Removable pads can be designed for application temperatures from 50 degrees Fahrenheit to 1,400 degrees Fahrenheit as well as all design conditions including outdoor applications, petroleum and chemical resistance, and clean room applications. MIDCO offers a variety of fabrication options including Kevlar Thread stitched seams, heavy duty stainless steel staples, and standard hog ring fasteners. Several options are available for closure systems including standard lacing hooks and stainless steel wire, nylon belting with stainless steel "D" rings, and industrial Velcro fasteners.